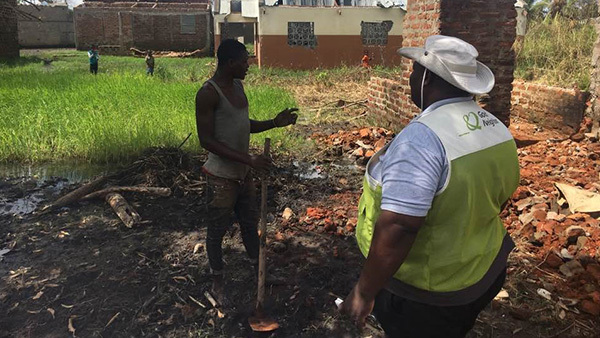 On April 3, Japan Platform (JPF) decided to take action to assist affected people by Cyclone Idai, which formed inside the Mozambique Channel in early March. In line with this decision, it has started calls for donations and asks for your cooperation. 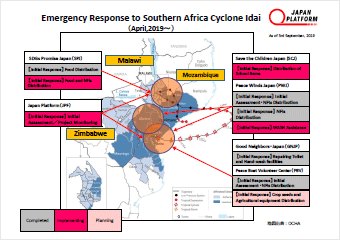 Cyclone Idai was formed off the east coast of Mozambique on March 11. 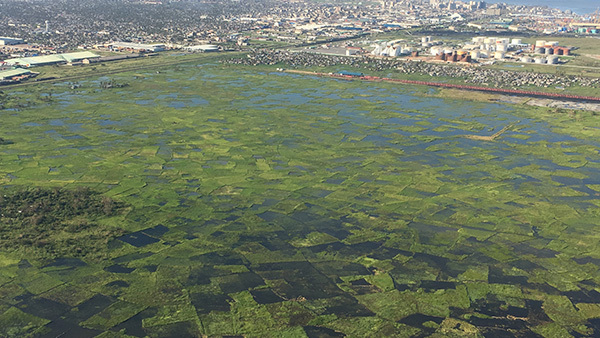 It developed as it made landfall on Beira, a city of 500 thousand residents in Mozambique, on March 14, and caused severe flooding due to storm surges. Subsequently, on March 16 and 17, torrential rain in multiple areas caused further damage including some rivers to overflow and dams to burst. *1　Heavy rain also triggered landslides in the eastern parts of Zimbabwe and southern parts of Malawi. *2 As a result, catastrophic damage has been brought about in these three countries. According to a report by the United Nations, the death toll in the three countries mentioned above has risen to more than 700 people. Over 3 million people have been afflicted and more than half of them, 1.6 million, are children. 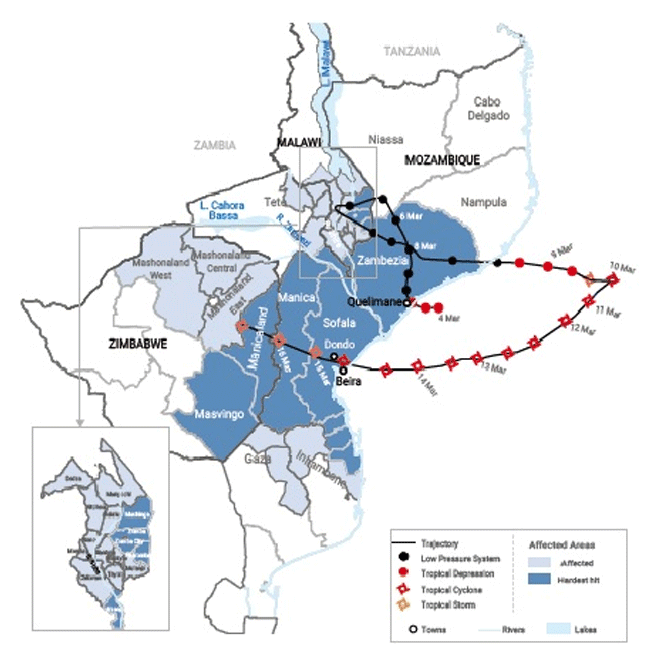 Over 140 thousand in Mozambique, 85 thousand in Malawi and 4500 in Zimbabwe have been forced to evacuate. The spread of cholera and the safety of children who have lost their parents are concerned. 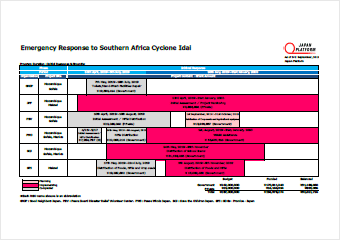 *1,3 The numbers of deaths, missing persons and affected people by cyclone are expected to rise in the coming days. 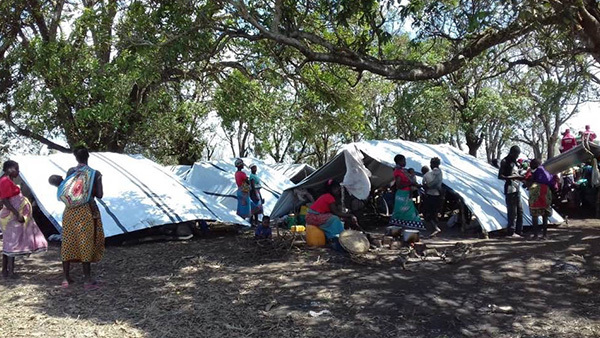 The Mozambique government and Malawi government have both formally requested international assistance. The Zimbabwe government has declared that it will allocate 100 million dollars to assist affected people. The United Nations Secretary-General commented that "Mozambique, Zimbabwe and Malawi have suffered one of the worst weather-related catastrophes in the history of Africa." JPF has been working with local governments, various international organizations, and NGOs to gather information on local needs and what assistance should Japan provide, and decided to take action on April 3. To respond to the situation on the ground where there is a shortage of everything and infrastructures including water facilities and roads have been severely damaged, each NGO is currently preparing to deliver aid that is urgently needed, including safe water, food, non-food items and shelters. JPF will work with relevant organizations to swiftly deliver emergency assistance that is in line with local needs. Further updates will be reported on the JPF website and Facebook. Distribution of food, non-food items, shelter repair kits, etc. Peace Winds Japan (PWJ), Good Neighbors Japan (GNJP), SDGs Promise Japan (SPJ), Peace Boat Disaster Relief Volunteer Center (PBV), etc. *The budget and implementation period may be re-examined based on the situation on the ground.